For each temporomandibular disorder (TMD) patient, every diagnosis is preceded by a thorough data gathering process, which begins with the standardized history and targeted clinical evaluation. A clinical assessment should flow naturally from the initial components of the history and follow a consistent pattern so that nothing is left out. If done in such a systematic manner, the information obtained will help ascertain the patient’s current functional status, diagnosis, and necessary imaging studies to obtain and to help begin to formulate treatment strategies. Lastly, this chapter will introduce the value of including electromyography combined with motion-capture technology as standard evaluations in the TMD clinical exam. 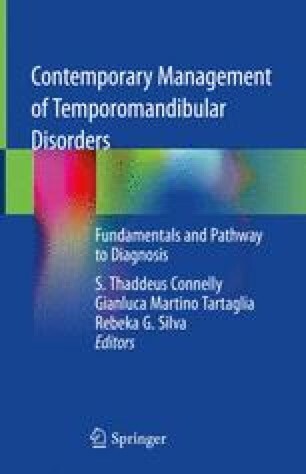 Ohrbach R, Gonzalez Y, List T, Michelotti A, Schiffman E. Diagnostic Criteria for Temporomandibular Disorders (DC/TMD) Clinical Examination Protocol International RDC/TMD Consortium Network 2014. http://www.rdc-tmdinternational.org/Portals/18/protocol_DC-TMD/DC-TMD Protocol - 2013_06_02.pdf. IASP. IASP taxonomy. 2011. http://www.iasp-ain.org/AM/Template.cfm?Section=Pain_Definitions2011 [updated 2011].